Invigorating hill air, Tibetan influences and acres of step farms carpeted with tea plantations offer you a honeymoon sanctuary in glorious green Darjeeling drenched in golden rays of the warm sun. Aromatic conifers and narrow hill trails take you to quaint hill spots, rich in natural beauty and magical charms. Trek up the Tiger Hill and view the spectacular sunrise that bathes the Darjeeling hills in hues of brilliant red and gold. Visit the Batashia Loop Memorial, Ghoom Monastery and the exotic Zoological Garden as you honeymoon in Sikkim with Honeymoon in India. Located at a height of 2134 meters above the sea level, serene green Darjeeling steeped in aromas of fresh hill tea lies at a distance of 686 kilometers from Kolkata, the capital city of West Bengal in East India. 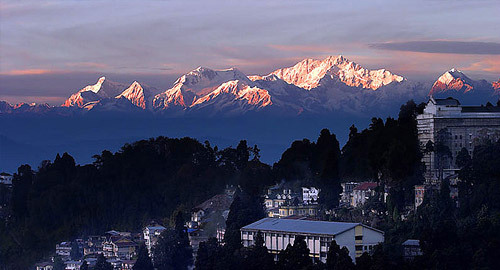 Stunning locales peppered with burbling waterfalls, adorn the picturesque Darjeeling hills that were discovered by the English during the British colonial occupation of India. This picture book land was converted into a summer hill resort for English families and you will still find traces of English influence on the brightly tiled gabled hill cottages set in the midst of dense green Darjeeling slopes.